Cullen. Just the name in Granger, Texas, turns people into royalty. But if a name comes with a pair of shadows the size of Texas itself, and there’s no changing the name, how can the shadow be escaped? 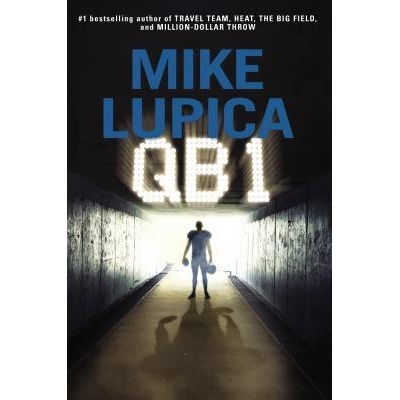 From the first word to the last, readers are held captive to the book QB1 by MIke Lupica. This book is for anyone who has ever felt like they live in a shadow. The main character, Jake Cullen, is a kid trying to escape from two huge shadows in his family. On page nine, it says “Jake Cullen- only his mom still called him by his birth name, Jacob- had always known he was going to have to get out from two shadows in high school football. His brother’s. And His dad’s.” This shows how Jake feels about his living his life in two shadows, especially in football. Jake’s dad, Troy, was a great quarterback for Granger high and won them a state championship. Even more colossal is his brother’s, Wyatt, who brought Granger a state championship last year and is playing for the Texas Longhorns, his dad’s dream. Bringing Granger, a town where football is the only thing that matters, a state championship makes the quarterback a god, but having two gods in one family, now that is pure royalty. Troy can only see Wyatt’s success and spends all his time focusing on it, the same way it has been for Jake his whole life. Jake shines bright winning games as a freshman quarterback in a tight competition for the starting job with the cocky Casey Lindell. When Wyatt struggles in college and Jake is playing excellently in high school, Jake’s dad still only cares about Wyatt. Jake is also bugged because he’s number two in love life too. Sarah Rayburn, the prettiest girl in school stares with mesmerized eyes at Wyatt like he is god. Can Jake win the starting job as quarterback for the Cowboys, win a state championship, learn to speak up with his parents, escape his brothers and fathers shadows, and maybe get a girl along the way? QB1 is an inspiring book for anyone who ever needs to find their voice. The story fully explains the characters and by the end of the book you will understand the way they think and know how they will react before they do. Mike Lupica’s QB1 is an excellent book that inspired me and you will be disappointed if you do not read it.